I've been successfully using X1, as recently as yesterday. 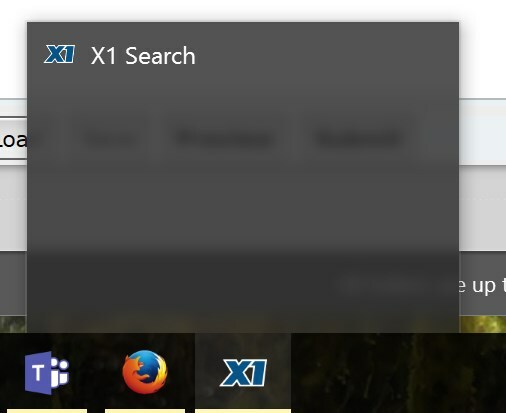 Today, when I attempt to launch, the icon shows up in the task bar, but the app doesn't display. Hovering over the icon sometimes shows a blank frame, sometimes shows a micro-screen. Nothing seems to be able to get the app to display on the screen. No error messages that I can see. I'm using Windows 10, and all other apps display fine. I've tried reboots and install - repair using the latest download from x1.com. OK, got it resolved. X1 was evidently resized off screen somewhere. When hovering over the popup frame or micro-display, I was able to get X1 to display full screen if I right-clicked over the pop-up frame and selected "Maximize". From there, a little jiggling and it came back to display as normal.